Perhaps 'Rearguard then Retreat' may have been more appropriate as a title - Jerry Murland sets out to examine the smaller actions of the retreat by the BEF in 1914. The final title in my modest acquisition program arrived a couple of days ago and so, barring a good uniform reference for the Great War, the 1914 section of the library is complete. By no stretch of the imagination can half a dozen titles be described as comprehensive coverage of a period (especially one so well written about as early 1914 on the Western Front) but it will suffice for my purposes. I may add the odd Osprey title but that should be it for the time being. The latest title is Retreat and Rearguard - The BEF's actiona from Mons to the Marne by Jerry Murland (ISBN 978 1 84884 391 2) and published by Pen and Sword. The author has made a point of detailing the smaller actions fought during the retreat which is valuable material for the gamer - especially one like myself who routinely enjoys lopsided actions on the tabletop! I am looking forward to reading this and am confident it will give me plenty of information and inspiration for any number of rearguard type actions. N Gauge plans are slowly being finalised in respect of this period and I will post once I have settled on what is happening. Moving forward a couple of years and to the cold and grey North Sea I have finally made a start on the last batch of capital ships for the Jutland project. The first batch will be the British battle cruisers of the Invncible and Indefatigable classes. Five of these were at Jutland but I have all six - H.M.A.S. Australia will be featured (obviously not at Jutland) and she will be accompanying the two light cruisers I have and the half a dozen destroyers. These are with a long term 'hunt the German raiding group' idea in mind. I hope to have these finished over the weekend and will be sure to post pictures once they are ready. I am quite sure that you would not often see the two subjects of the title mentioned in the same post but I never was one to shy away from the obscure or the odd! Not bad for what is supposed to be a cake decoration! The palm trees arrived from the USA and very nice they look as well. They satnd roughly 3 1/2" tall and the plan is to base them on the round wooden bases that I use for my other trees and to give them a basic paint job. I did buy rather more than I needed though so if anybody wants a pack (there are 10 bases each of two trees) then let me know - I can think of at least one of my readers that would be interested! An inspiring addition to the library - his book on the Franco Prussian war - A Day of Battle - is another superb title. Keeping on with the 1914 theme of my current reading I managed to track down a copy of the classic account of the BEF retreat - The Mons Star by David Ascoli. I have read this book a number of times and it is a cracking account of the overall campaign from the British perspective. It complements Riding the Retreat very nicely and the third title I have en route will finish off the section in my library devoted to this phase of the Great War. There is a hidden agenda behind all this 1914 'stuff' which will probably not come as a surprise to anyone that reads this blog - full details will be forthcoming in due course. At long last a couple of items arrived that I have been waiting on for some time - roughly four weeks in each case. The first was the last of the ships from Stonewall Miniatures for the capital ship phase of my Jutland project. This is a pair of Queen Elizabeth class battleships and a pair of the earlier Orion class. There was also another dozen M class destroyers. The battleships will be based and undercoated over the coming weekend with a view to making a start on the models as well. The first batch will be from the RN and my feeling is that it will be the Battlecruisers. The other arrival was a box of some 3" high plastic palm trees. These started life as cake decortions and are really rather nice. They are moulded with a brown trunk and base and with some green fronds and would be usable as they are although a quick paintjob would certainly improve the look. For some reason I am unable to upload any pictures so I will try and add some later so you can see what they look like. I have had a very productive and thought provoking day today - with a great deal of sorting out, preparation and the inevitable thinking of great thoughts. To begin with, I am still waiting on the final models from Stonewall Miniatures for the last of the capital ships for the Jutland project. In the meantime though, I based all the remaining models from the last batch of Panzerschiffe ships so that once the four battleships for the Royal Navy arrive I can set to with the paintbrush. There are some 31 models to tackle - 13 for the Geramns and 18 for the RN. I shall be really pleased to get these done so that I can then think about how I am going to tackle the thorny question of light ships - light cruisers and destroyers. Whilst in the Jutland zone so to speak I also took the opportunity to set up an A4 ring binder for the Jutland project so that I can keep all the notes, screen prints and photocopies in one place. I called this folder, with a stroke of creative genius, Jutland. I also had a pretty major tidy up of various bits and pieces - mainly of a sci-fi and fantasy nature - which was long overdue and despite being pretty mundane was vastly satisfying. the main part of this was in respect of armoured space marines and chittering hordes of 'not quite alien' aliens. Finally, and probably most significantly, I have made a fairly big decision in respect of my recently acquired 20mm WW1 Middle East collection. You may recall that I have offloaded some of the collection (roughly 40% in respect of the numbers involved) but retained all of the best quality painted figures. The collection is now finely balanced although I would have needed to add a few items here and there. I am now going to offload the rest of the collection. That's right - I am now going to offload the rest of the collection. I am being hugely practical about this and the rationale makes perfect sense (at least it does to me). The collection came about as a bolt from the blue. For sure it was a collection that was going to appeal to my interests and the price was right (and it coincided with a a great spell at work so buying it was not a problem) but in terms of the scale it was not what I wanted to do. If I am honest then I guess I purchased it because I could and the fact that it coincided with my long time interst in the Great War in the area then that was a a happy coincidence. If you recall I had made the decision to go down the N-gauge route just before the collection came on the market. Since it has been in the man cave I have spent a lot of time thinking about how I could move on and tackle various other periods in 20mm (especially WW2 in the desert) as this was now going to be my scale of choice - except that it was not supposed to be! In a way I succumbed to the notorious 'Ooh shiny' syndrome with the difference being that I can turn this to my advantage. To be honest, the main driver behind this decision is one of economics. From the monies that I could get for selling the remainder of the collection I would be able to complete at least three, possibly four other projects - and that is a major factor for me. I did not buy the collection with the intention of offloading it for a quick profit but practicality means that if I can tackle those projects I want to from the disposal of a tangible asset then so be it. Today was a very special day in the Crook household. Holly, my daughter, was one of thousands of students up and down the country going to collect her A Level results. She came away with an A Star, an A and a B grade for the three subjects she took. Am I a ridiculously proud and teary-eyed, sentimental and smug grinning old duffer? You bet I am! Many, many congratulations to my darling daughter - you have made mum and I so proud! Readers of the blog will doubtless recall that I am a great fan of the Late Prof. Richard Holmes assorted books on military history. I have always enjoyed his style of writing and own several of his titles. My favourite title of his is Riding the Retreat (ISBN 0-224-03762-5) and I have owned at least three versions in paperback. The book is combined history/travelogue in which the author and some friends followed the route taken by the retreating BEF in 1914 on horseback with the historical tie-ins being accompanied by his own horsey adventures en route. The book is both informative and amusing by turns as the author and his chums deal with equine problems great and small whilst seemingly consuming vast quantities of continental cuisine at every opportunity. It is a delight to read and the as you would expect, the history side is also very well taken care of. I had wanted to add a hardback version to my library (I always try to do this as a matter of course for those titles I want to keep - paperbacks for me tend to be quite shortlived) from my first reading of this book but had been unable to get a copy - especially at the staggering prices I had seen this being sold for secondhand. Imagine my surprise and delight then when I came across a copy on evil bay for the measly sum of £2.99 post free. Needless to say this was snapped up (it was a 'buy it now' item) and it duly arrived yesterday morning. I suppose the timing of acquiring this book could not be more coincidental than if I had planned it bearing in mind the centenary of those events back in August 1914 - although the Great Retreat did not start until around 23rd August 1914. It is close enough to make one think though and to remember the herculean efforts of the 'Old Contemptibles' during the first summer of the Great War. At long last - and I only wish I had gotten it sooner! This morning saw the arrival of my desert Hexon tiles - Huzzah! 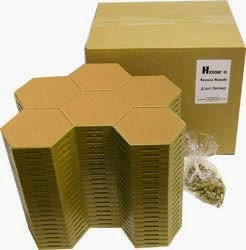 I purchased a single box of the 6 hex tiles (21 of them) and two packs of 10 single tiles, plus a further pack of ten green flocked tiles for my verdant set. Sadly the latter will have to be returned as they sent the wrong tiles - they are the green/earth mixed version when I wanted plain green - but happily the desert set is fine. The first thing that struck me was that the colour is actually more of a light brown rather the orange/sand colour you see on the website which means that it is far more versatile than I first envisaged. It also means that the figure basing will be far more usuable in respect of the terrain as it could be used for anyting from Spain to India - anywhere where the ground is parched, arid, dusty or akin to the Western Front in 1916! Needless to say I am delighted and so now have no excuse for not tackling the rebasing of the WW1 Middle Eastern collection. The picture above was of the figures I received from Bob - he had very kindly sent me this so I could see what the models were like. Note the double-barrelled 77mm field gun sans the trail on the left - now happily rectified. Well talk about outstanding customer service! You will recall from my last post that I had met with Bob Cordery on Tuesday and collected via our exchange a couple of bags of B and B Miniatures Arab tribesmen and three German 77mm field guns - one of which was missing the trail but had doubled up on the gun barrel. I contacted B and B on Wednesdayto place a small order and asked if it was possible to get a replacement trail - which I was more than happy to pay for. This was agreed (and gratis I might add) and so imagine my surprise when I got home this evening - two days after placing the order - to receive not only the pack of Arabs but two trails, two gunshields and two pairs of wheels. Absolutely first class service and so now I have four complete 77mm field guns. I am really pleased with this and am now casting covetous eyes over the WW1 East African range. At this rate I will soon be joining the big boy's club with my very own unpainted lead mountain! On Tuesday just gone I had the pleasure of a brief lunchtime meeting with Bob Cordery. He was in town and as his journey passed to within around 200 yards of my office we arranged to meet during my lunch hour for a brief catch up and an exchange of various wargaming bits and pieces. As is usual when we get together the conversation flowed across various topics and as usual, I came away suitably inspired with a couple of good ideas to think about. The main one concerns basing which I shall certainly be trying once my Hexon desert terrain arrives. It was a real pleasure meeting up with Bob and I listened with vicarious delight as he regaled me with further tales of the great lead mountain and shed clear out! You can follow the progress of this gargantuan undertaking on his blog - just click on the link above. The horse trading we undertook (actually there were no horses involved - just lots of infantry!) left me with a couple of bags of B and B Miniatures WW1 Arab tribesmen on foot and three German 77mm field guns with crews. All of these will be most welcome for the WW1 Middle Eastern collection but there was a minor problem with one of the guns. The pack contained two barrels but no trail. Undeterred by this I got in touch with B and B to enquire if I could purchase the missing part. I received the reply back very quickly and was delighted with the response as they would be happy to send the missing piece free of charge. I was going to place a small order with them in any event and so the missing piece will be included with the extra bag of Arabs. I was really impressed with this level of customer service and so I shall certainly be using B and B again for some of the other WW1 figures I need. The plan around the Arabs is to repaint the existing cavalry and camelry (I have some 15 of each) and then to add the infanry. Under my organisation there will be two units, each of six models (3 bases) for each the mounted troops (four units in total) and four units of eight models (4 bases) for the foot. That will suffice for a self-contained raiding force and I will add in due course the Sanusi regulars - probably four units of eight models. This weekend will see the great rebase starting in earnest - it will also mean a change of storage for the collection as well. It has been a relatively quiet and uneventful weekend but I have managed to get in some thinking time - which is always worthwhile in my opinion. I am still waiting for the last of the ships from Stonewall for the Jutland project - once I have these the plan is to get them cleaned up, based and undercoated with a view to tackling the painting once the rebasing of the WW1 collection has been completed. I am still pondering the WW1 Middle Eastern collection and the basing technique I will use although this will be easier once I have my desert Hexon to hand. I know how I am basing the models but at this stage I am still pondering about the paint job/texturing I shall be using. I will be adding to the collection but as everything I will be getting is pretty much an add on rather than essential it will be a more pleasurable experience -especially the painting which I am looking forward to. For the Nth time I am I am so pleased that I persevered with the block army collection because the gaming experience I gathered has really stood me in good stead for the translation into figures and models. As my games are going to be fought using a grid based playing area in the fashion of Command and Colours I now have a clear idea of the size of actions I can fight and more importantly, the amount of 'kit' I will need. Using the 4/3/2 system of bases per unit works fine although I will probably use markers for hits on artillery, support weapons or vehicles. Had I opted for 10mm then the plan was to have individual bases for these units so, for example, a tank unit would have 3 models. The armies I will be using are relatively modest in size - usually around a dozen or so units - but with sufficient variety in order cover any eventuality. I suppose rather like an enlarged DBA army with all the options. 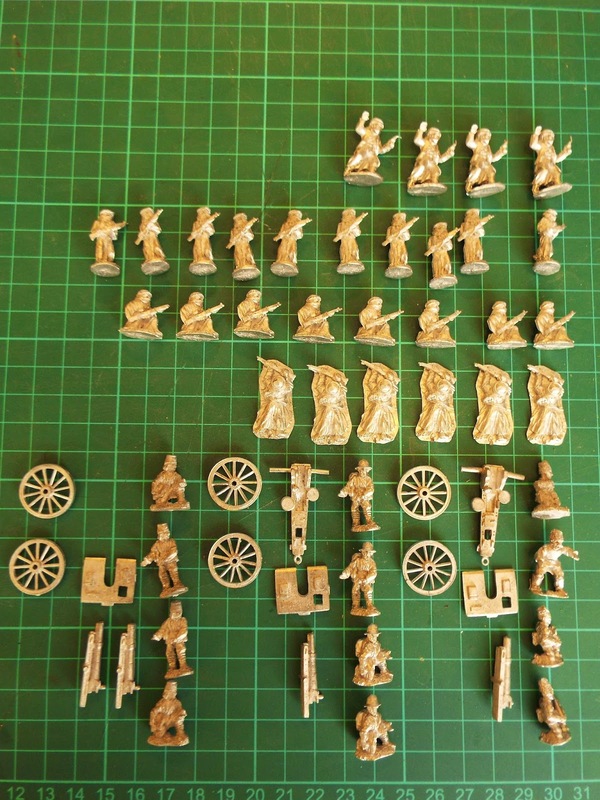 It is rather funny in a sense as I had not really thought about using 20mm figures - if you recall I was looking long and hard at 10mm (and had decided on them - to the extent I have some for the Russo Turkish War) - until providence delivered the collection I am now trying to reorganise. My very first adventures in wargames back in the early 1970s were of course using Airfix figures so it is almost going back to my roots in a way. Besides, it will give me an excuse to tackle some kit bashing at long last. Much to ponder going forwards then. Once again the lure of the desert-loving Englishman - note the picture of my old friend T.E. Lawrence in the centre foreground. Some time ago I acquired a copy of the above title to supplement the Arab Revolt section of my WW1 library. If I am honest I made a start on reading the same but inevitably got sidetracked and so the title was returned to the bookcase, forlorn and unloved. I have been spending rather more time than I intended at this stage thinking about how best to utilise the WW1 Middle Eastern collection. I have pondered various ideas - mostly around the concept of a campaign setting that could be used for a variety of linked games. Then I remembered the above title - almost an Arab Revolt within the Arab Revolt if you like. 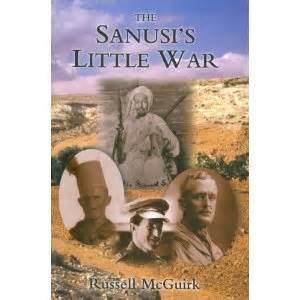 The Sanusi revolt has all the makings of a cracking little campaign for the wargamer. To begin with you can field North African tribesman coupled with regulars and supported by Turkish machine guns and artillery against British, ANZAC and Indian troops with armoured cars - even with naval gunfire support for the RN. The historical campaign would be fun enough on its own BUT - what if you beefed up the Turkish presence to include regulars and allowed the various German advisors/agents/agitators to do likewise? From a practical perspective I would need to add some troops to the collection to make the above viable. To begin with I will need some North African tribesman. To my knowledge you cannot get Sanusi irregulars in 20mm so I shall use standard Arab types. This has the advantage of meaning that I will also be able to tackle the actual Arab Revolt in due course. I will then need some Sanusi regulars which are available. The Imperial forces will need some Sikh infantry and both sides will need to have their respective artillery parks expanded to include mountain guns for the Sanusi and 18 pdrs for the Allies. The terrain over which the action will be fought will be familiar to anyone that has gamed WW2 and will be replicated quite simply by using my soon to arrive desert Hexon terrain. Best I crack on withthe rebasing then!